The town of Rowley, Massachusetts, was founded in 1639, by the Reverend Ezekiel Rogers and his company. The original grant, was from Ipswich on the south to Newbury on the north, and from the ocean on the east to the Merrimack River on the west. Mr. Ezekiel Rogers was the son of the Rev. Richard Rogers, a distinguished Puritan, of Weathersfield, Essex county, England, was bred at Cambridge, where, in 1604, he was of Corpus Christi, when he was graduated as a Bachelor of Arts, and of Christ's College, in 1608, when graduated as Master of Arts. After leaving the University he became chaplain in the family of Sir Francis Barrington, of Essex, exercising himself in ministerial duties for about a dozen years. He then was called to a public charge, at Rowley, in Yorkshire, where he continued with great favor for about seventeen years, when he was compelled to relinquish his charge — as he tells the story in his will, "for refusing to read that accursed book* that allowed sports on God's holy Sabbath, or Lord's day, I was suspended, and, by it and other sad signs of the times, driven, with many of my hearers, into New England." Rogers with twenty or so Yorkshire families took passage on the ship John of London, and set sail in the summer of 1638 from the Old Harbour in the River Hull of Yorkshire. Their destination was Boston, capital of the Massachusetts Bay Colony of New England; and their captain was Master George Lamberton, an experienced mariner used to sailing the treacherous waters of the Atlantic. They carried with them a printing press, which went on to Harvard College to become the first press in the colonies. As their voyage was long, it was not until December of 1638 that they dropped anchor at Salem Harbor in Massachusetts, the John of London being but one of several ships utlimately organized by Rogers to bring families to the New World. Captain Lamberton brought Rogers straight to Boston where he was introduced to Reverend John Davenport and a wealthy London merchant named Theophilus Eaton, who with Lamberton were starting a new settlement at a place then known as Quinnipiac, but later came to be called New Haven. John Winthrop, the governor of Massachusetts, referred to Roger's families as "Godly men, and most of them of good estate", which made them desireable settlers. As such, Davenport, Eaton and Lamberton tried to entice them to settle at Quinnipiac. Rogers was inclined at first to do so, but when things did not work out to his liking, he declined the offer. Some of his followers from other ships did indeed go on to New Haven, but, so far as we know, those he sailed with on the John of London decided to wait out the winter in Salem, and seek other opportunites when spring arrived. Still the defection of some of his company to New Haven affected him deeply, and he wrote in a letter to Governor Winthrop that he felt Lamberton had led caused him much grief. Lamberton, who became estranged from Rogers over the affair, settled on one of the choicest lots in New Haven, and went on to help found other settlements in the colony. An interesting footnote is that a few years later he became captain of the first sea-going vessel to be built in New England. 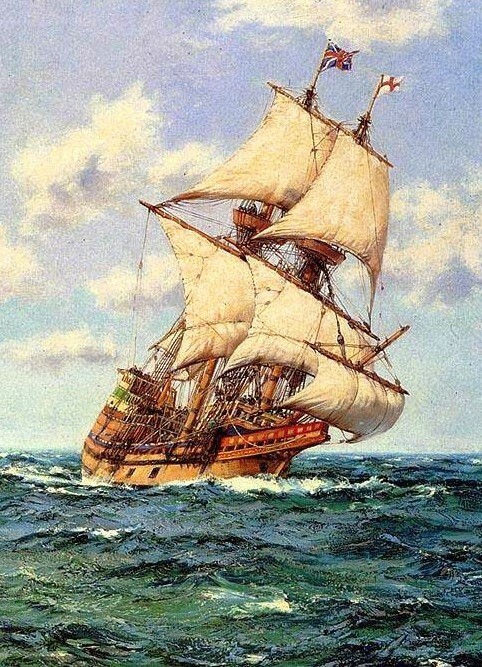 Called the "Great Shippe" by some it was chartered by "The Company of Merchants of New Haven" to set sail for England from New Haven in January of 1646 with a valuable cargo to make money for its investors. Sadly, when the "Great Shippe" sailed off into the winter mists with Lamberton at the helm, it was never seen nor heard from again, being immortalized 200 years later as the "Phantom Ship" in Longfellow's poem of the same name. Our history continues below with a quote from Gage (1839). 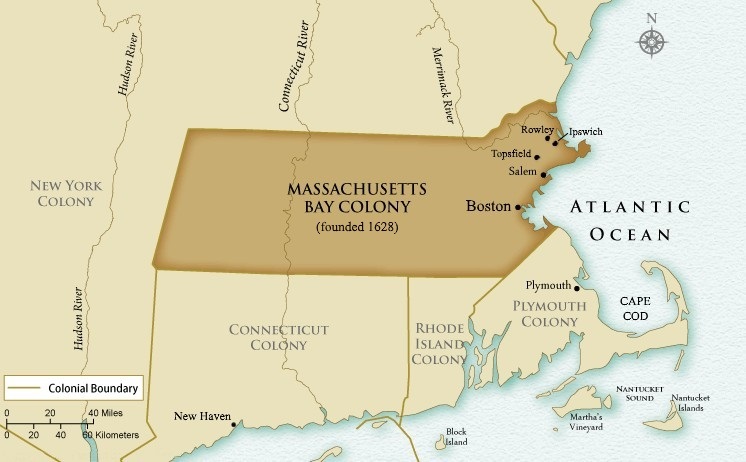 Notwithstanding the many and great discouragements under which the first settlers of the Massachusetts colony labored, they were prosperously increased by great numbers of emigrants from England, who arrived from year to year. For several years, next after 1631, about twenty ships, with passengers, arrived each year. The number of inhabitants were so increased, they were forced to look out for new plantations every year; so that, within a few years, every desirable place, fit for a plantation on the sea-coast, was taken up. On the arrival of Mr. Ezekiel Rogers, with about twenty families, in December, 1638, the ... towns of Salem, Charlestown, Boston, Medford, Watertown, Roxbury, Lynn, and Dorchester, together with Cambridge, Ipswich, Newbury, Weymouth, Hingham, Concord, Dedham, and Braintree, were all occupied. They therefore spent the winter in Salem, improving the time in looking out a place for a plantation. Mr. Rogers was a man of great note in England for his zeal, piety, and abilities. Mr. Eaton and Mr. Davenport exerted themselves, therefore, to persuade him and his company to proceed to New Haven, and settle with them. In consequence of these importunities, he made a partial engagement to comply, and sent on several of his company to examine the place, who, not finding every thing to their satisfaction, and he, feeling his responsibility to many persons of "quality in England, who depended on him to choose a fit place for them,"consulted with the ministers of Massachusetts. By their advice, he and his people concluded to take a place between Ipswich and Newbury; and these towns having granted some farms on this tract, Mr. Rogers's company purchased them at the price of £800. ... [He] then came with his people to this place, at first called "Mr. Rogers's plantation," afterwards Rowley; so called from Rowley, in Yorkshire, England, where he and some of his people had lived. The precise time of their removal to Rowley is not known. It was probably as early as the last of April or first of May, 1639. [The town was built, and] the act of incorporation is in the following words. "The 4th Day of the 7th Month [September] 1639, Mr. [Ezekiel] Rogers' plantation shalbee called Rowley." Mr. Rogers brought over from England with him, but about twenty families, as before stated. Before coming to Rowley, however, he had increased his company to about sixty families. Anonymous (1851), "Rev. Ezekiel Rogers" in Memoir of Rev. Nathaniel Rogers' Family. New England Historic and Genealogical Register, v. 5, p. 119-128. Blodgette, George (1888), "Chapter XCI: Rowley" in History of Essex County, Massachusetts (edited by D. Hamilton Hurd). Published by J.W. Lewis & Co., Philadelphia, v. II, p. 1128-1133. Blodgette, George and Jewett, Amos Everett (1933), Early Settlers of Rowley, Massachusetts. Published by Amos Everett Jewett, Rowley, Massachusetts. Gage, Thomas (1839), The History of Rowley. Published by Ferdinand Andres, Boston, 483 p. There is also an indexed digital version available online at the Gordon College Faculty website. Last accessed 15 July 2018. Isaac's Story (2013), "The Story of George Lamberton and the Phantom Ship". Online article at Scrapbook Your Family Tree. Last accessed 15 July 2018. This is an evolving document.